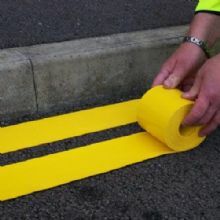 Ennis-Flint Prismo Flexiline Waking Man Symbol is a preformed thermoplastic road marking. It is ideal for heavy duty exterior use. Ennis-Flint Prismo Flexiline is the perfect solution to permanently marking car parks, roads, cycleways, airports, docks and playgrounds etc. Quick & easy to apply from standard road markings, to personalised logos and graphics. Ennis-Flint Prismo Flexiline Symbols provide all your requirements, for hard wearing, quick & easily applied surface marking solutions at any time of the year. With the performance of hot applied thermoplastic, these markings will last for years!